Nothing To Do With Arbroath: Can't. Quite. Reach. Idiots with a juvenile pet raccoon. They've removed the drawer pulls, so it clearly has access to living spaces. 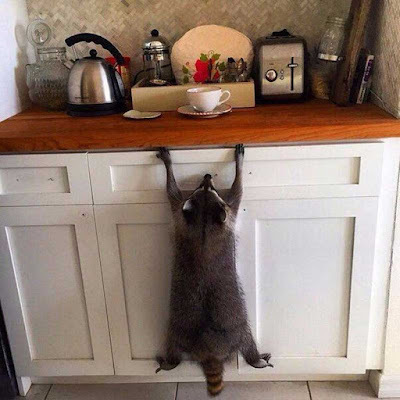 There's an electric kettle, not common in North America, further indicating this is not a raccoon intruder. They act up when they mature, frequently bite, and usually end up obese. We have plenty of them OUTSIDE in Seattle. It is illegal to keep them as pets and no vet can legally tend to one. European idiots. So many things to destroy up there and I just.. can't.. reach.